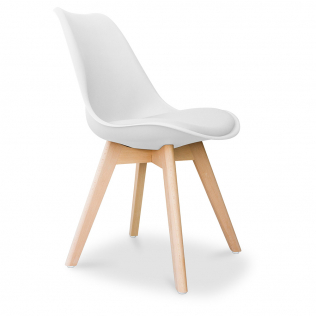 High quality reproduction in the style of the Tulip Chair Eero Saarinen. Designed in 1956 by Eero Saarinen, the Tulip Chair with its central leg still amazes with its elegance. The organic design of the Tulip Chair gives it a timeless look that will fit into any interior. The foot of the Tulip Chair is perfectly rigid, ensuring the chair's stability. A precision genius, Eero Saarinen offers us a sensational cocktail of know-how, imagination and comfort which will instantly win you over. This modern design chair will be an asset to any room in your home with its contemporary touch. This dining room chair can also fit well in a kitchen, living room or office, in fact any room. Today, does it again with this Tulip Chair Eero Saarinen style - Fabric - White shell - Fiberglass.We are helping to bring you design products that cannot be found elsewhere at cost prices directly from factories in Asia. Our team is always on the lookout for unique, top quality products and we are stepping up our efforts to bring you choice and quality at cost prices, products that will charm you with their design, their originality and their price!